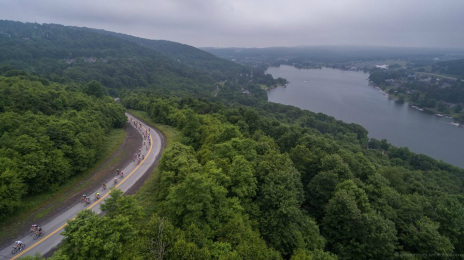 Garrett County and the Deep Creek Lake area boast some of the finest and most challenging cycling in North America, and the Garrett County Gran Fondo has established itself as a premier North American Gran Fondo unsurpassed in challenge, scenery, and riding quality. The Garrett County Gran Fondo has a ride for everyone from the recreational cyclist to seasoned professionals with five supported ride options. The 125 mile "Diabolical Double", the 102 mile "Savage Century", the 62 mile "Masochistic Metric", and the 44 mile "Fabulous 44" all contain very steep and challenging hills. The "Garrett's Greatest 25" includes hills but is appropriate for the recreational cyclist not desiring to undertake the more extreme Gran Fondo ride offerings. For registration and more information on the rides visit our official Gran Fondo website.